In mythology, Cerberus is the three-headed dog that guards the gates of Hades. How perfect a name for a company whose leaders have sold their souls. 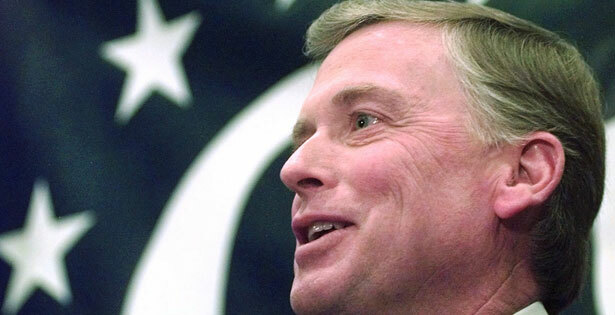 How fitting that Dan Quayle, a bumbling excuse for a vice president of the United States, should end up as a top executive of a $20 billion private equity firm mired in controversy. Quayle, who signed on with Cerberus in 1999, was with that company during its takeover and subsequent bankruptcy of Chrysler, questionable military contracting deals in Afghanistan and, most recently, manufacturing the assault rifle used in the Newtown massacre. The former Indiana senator, to whom most of us in the press corps covering George H.W. Bush’s presidential campaign in 1988 referred to as the Ken doll, must have found life in the private sector so much more rewarding, but how much so is not known, since Cerberus is privately held. Dan and his son Ben Quayle, a congressman from Arizona, have been ardent supporters of the NRA, but even they must have been shocked by the latest—and not only—incident involving one of Cerberus’ product lines. The company now acknowledges that its gun unit, Freedom Group Inc.—which refers to itself as “the largest manufacturer of commercial firearms and ammunition,” sold in eighty countries—is a public relations embarrassment and has put it up for sale. In case you missed the connection, as did too many in the mainstream media, the former vice president was rewarded for his gaffe-filled performance in that job with the far more lucrative position of chairman of Cerberus Global Investments LLC. He was hired for that post by Cerberus CEO Stephen Feinberg, an alum of the disgraced and defunct junk bond emporium Drexel Burnham Lambert. In addition to owning Bushmaster, the manufacturer of the assault weapon used in Connecticut, Cerberus’ holdings have included Chrysler Corp., bailed out by US taxpayers, and DynCorp, the military construction contractor that is the subject of a major special inspector general’s investigation of its activities in Afghanistan. All three businesses are deeply dependent on decisions of the federal government once served by Quayle and other high members of the Cerberus team. One of those is John W. Snow, listed on the Cerberus website as another member of its “senior executive leadership.” Snow was secretary of the Treasury in the George W. Bush administration. He resigned from that position effective June 29, 2006, and four months later, on October 19, Cerberus issued a press release announcing that Snow had been named chairman of Cerberus Capital Management LP. The appointment proved helpful, given Snow’s government experience, when Cerberus took over Chrysler in 2007 and soon went shopping for Washington’s assistance to keep the company afloat. Feinberg, who in reality runs all of Cerberus as its CEO and chief investment officer, is one of those financial backers of the GOP who derides government interference in the market any time it threatens to help ordinary folk. But when he bought Chrysler, one of those distressed companies that he specialized in dismembering, he quickly found a need for massive federal intervention to preserve a fraction of the Cerberus investment. With the aid of Quayle, Snow and other politically connected members of the firm, Feinberg made the rounds in Washington at the end of the Bush administration begging for what right-wing free-marketeers would label as the socialization of Chrysler to the tune of $4 billion in federal aid. It was not enough to avoid eventual bankruptcy and additional government support, but by then Feinberg and Cerberus had bailed. In its attempt to save Chrysler, Cerberus had hired former Home Depot CEO Robert Nardelli to turn the company around, but he failed. He reappeared in 2010 as CEO of Cerberus’s Freedom Group Inc., with its “family” of fifteen gun and ammo companies including Bushmaster, Remington and other top selling brands. Nardelli continued in that position until March of this year, when he stepped down. During his tenure, he was instrumental in advocating against stronger gun control as well as enlisting endorsements from the NRA, and he remains a senior adviser to Feinberg.